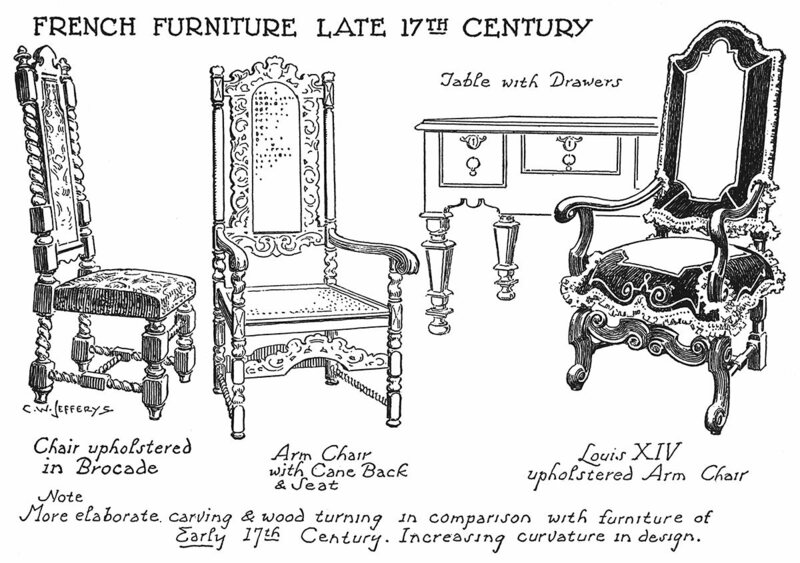 Early seventeenth century furniture and interior decoration was square and angular in character. Chair backs came no higher than the shoulders, legs were either straight and square in section or with corners slightly bevelled, sometimes the legs and uprights of the back were twisted in spirals alternating with spindles and straight pieces at junction points. This tendency toward curving shapes increased during the century until straight lines had almost disappeared. At the same time the height of the back increased, extending above the head, so that the general shape of the chair was perpendicular rather than square. This upward movement coincided with higher ceilings and the upright panelling of the walls, while at the same time the earlier low chests or "armoires" developed into taller chests of drawers, wardrobes and "highboys." During the first half of the century seats and backs of chairs generally were covered with leather, fastened by large-headed brass nails set close together. Sometimes the seat leathers were cut into ornamental fringes around their borders. Gradually materials such as silk, stout cloth, plush and velvet, came into use. These fabrics were often decorated with floral designs, stamped, woven or embroidered, and were gathered into frills and fastened with braid along the borders. Beds were of the four-poster type, the wooden framework entirely hidden by canvas or leather canopies and corner strips falling to the floor, while drapery curtains enclosed the whole, to exclude the draughts. Dining tables were long, and capable of extension by various devices. Benches as well as chairs were used to seat the guests. 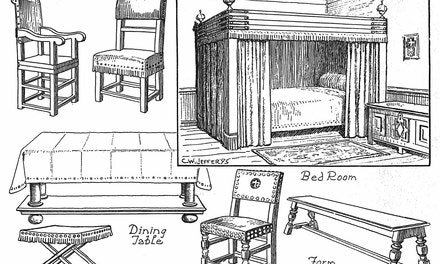 The foregoing notes describe, and the drawings depict the furniture of the better houses, much of which was brought from France. 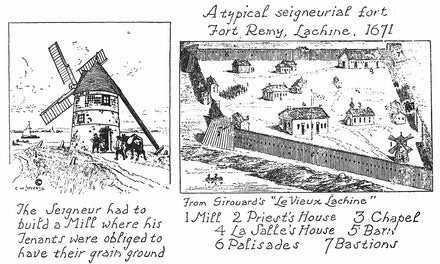 In the pioneer homes on the frontier, and in most of the habitant houses, the furniture was much simpler, often being hand-made; but the proportions and general shape were much the same as those pictured and described. For chair seats deerskin or rushes or splints of inner elm bark were used, while the backs were made of wooden slats and rails. The earliest beds were bunks, made of poles driven into the walls and supported by posts, covered with pine or spruce twigs or marsh hay. As conditions improved mattresses were used, stuffed with these materials or with feathers, and built-in beds were made of planks entirely enclosing the sleeping place from floor to ceiling, with a sliding door and wooden barred ventilating panel. Low, roughly squared logs were used as seats and dining tables for the younger children until well into the nineteenth century in many habitant homes.